Launched in 1951, the trans-Atlantic passenger liner SS United States was a triumph of American engineering. Designed for speed, safety, comfort and easy wartime conversion to a troopship, the ship incorporated numerous innovations in its construction. During her maiden voyage, she captured the speed record known as the Blue Riband for both the eastern and western crossings of the Atlantic. Commercially operated from 1952 to 1969, the SS United States carried thousands of passengers between Europe and New York City in speed and style. Among her passengers were such notables as John Wayne, Bob Hope, Salvador Dali and the Duke and Duchess of Windsor. 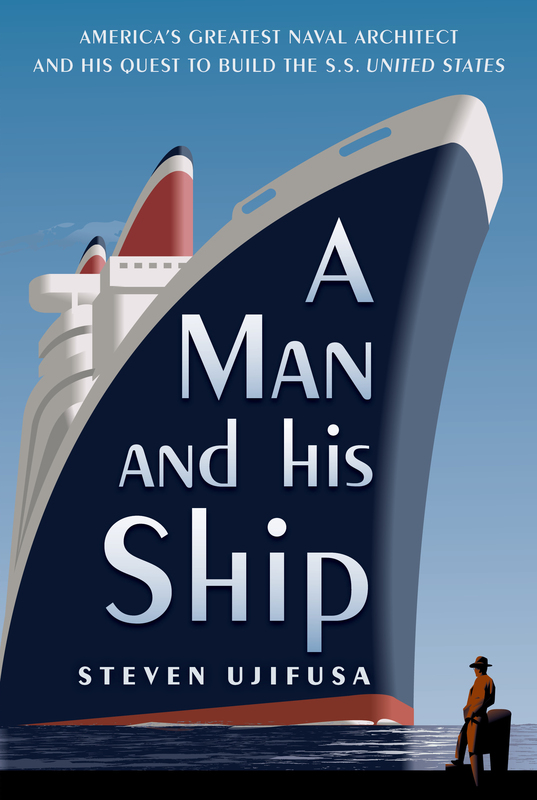 Historian Steven Ujifusa’s recently published A Man and His Ship is a history of the SS United States and her designer, William Francis Gibbs. In his book, Ujifusa masterfully weaves together the biography of William Francis Gibbs, his quest to design the ultimate passenger liner and the construction and life of the SS United States. Neatly divided into two parts, Ujifusa opens the book with William Francis Gibbs’ life prior to the construction of the SS United States. Gibbs had no formal training as a naval architect and yet he went on to a wildly successful career in naval architecture after designing and pitching a ship in collaboration with his younger brother. Ujifusa lays out Gibbs story in a manner compelling to any reader interested in what drives individuals to the pinnacle of success in their field. The second half of the book focuses on Gibbs’ crowning achievement – the design, construction, life and record-breaking performance of the SS United States. Ujifusa writes with a style easily accessible to a layperson and doesn’t require a knowledge of the minutiae of naval architecture. Ujifusa concludes with the recent history of the ship including an unsuccessful attempt by Norwegian Cruise Lines to utilize the ship as a cruise liner and the current plan by the SS United States Conservancy to convert the ship to a floating hotel/conference center in Philadelphia or New York City. In sum, A Man and His Ship is a page turning tome celebrating the ingenuity, self-motivation and indomitability of the American spirit.